I've been planning to show how I make Lithophanes for a few years now but somehow never managed to get around to it. It is also a good opetunity to try out the Masso CNC controller i have had for a coupe of months now. I've been learning how to use it while it has been set up in my office but you are limited as to what you can learn without connecting it to a machine and actually use it. Theory only gets you so far. As it turns out I am very pleased with how it works and will be using it in future projects but don't worry, I will continue to use UCCNC and Mach3 as well. Getting back to Lithophanes I think they are one of the most impressive projects you can make with minimal effort. It requires no real skill to create other than good judgement on what subject makes a good lithophane. Choice of the right material to cut the lithophane from is also important for my project as I will explain below. 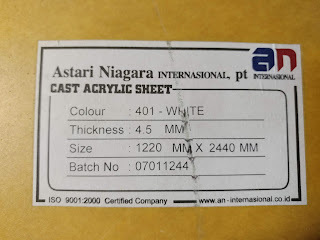 I used Cast Acrylic and below is the label that came on the sheet for those who are interested. If you cannot find this particular product and have a choice of various white acrylic / perspex to chhose from then choose the one you cannot see whtough when you hold it up to the light. 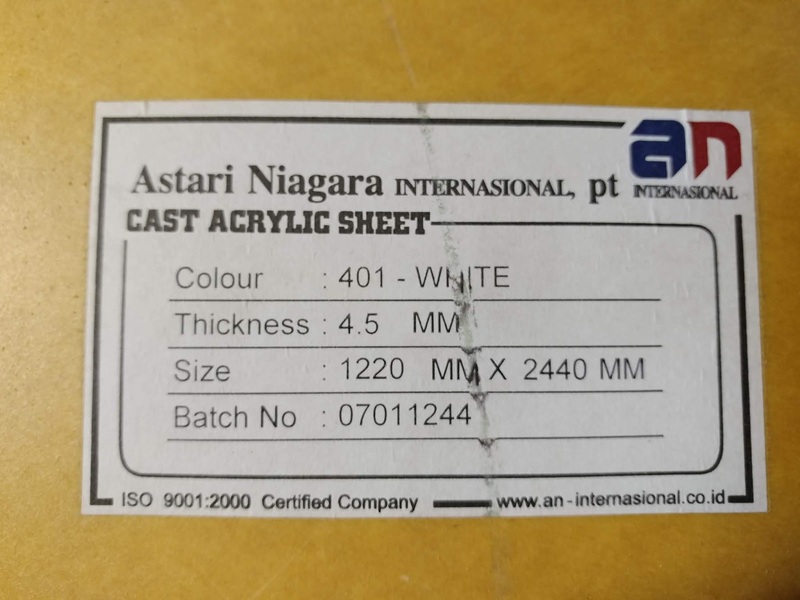 If the acrylic is translucent then it won't work. You are relying on the light stopping properties to give you black and when you get it thin enough you will be able to see light through it. I'm also told that Corrian is very good for Lithophanes though I have not see Corrian myself in New Zealand. Originally I started out with dremmel 2.3mm and 1.4mm cutters but they were delicate, high speed steel and not ideal. This was a time before I had ever heard ot tapered spiral cutters but I had some 30 degree carbide cutters with broken tips. I decided one day to give one ago and see what happened. As it turned out it cut really well so I have used them ever since. the tip is the weakest part so when the very end of the tip breaks off the larger tip that is left is stronger than the original and so long as it isn't too big you won't be able to tell the difference between it and a ball nosed cutter. That's my opinion anyway. For those who want to try out tapered Ballnose cutters check out the link below. The EZE-LAP stones I use the most is the red one which is the Fine 600 grit. I use it for Sharpening my Carbide Cutters though the Super Fine one can improve the edge as well. The set ranges from Coarse to Super Fine though if you do a search for EZE LAP you will find other options but the format of this stone makes sharpening cutters the eaisest. This was the first Vectric software I purchased and have used it for many projects over the years. 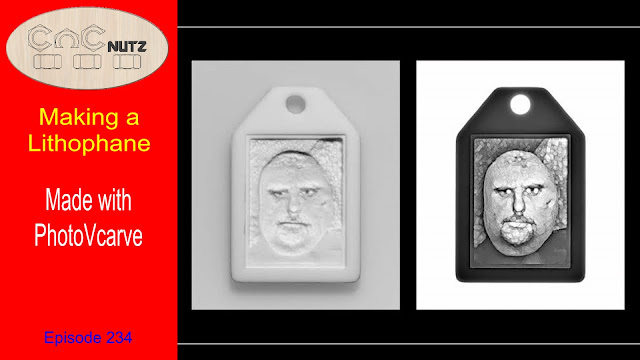 While Lithophanes can be done in Aspire, I recognize that many people cannot afford to purchase the software but PhotoVCarve will allow you get started with lithophanes. If you want to have ago try downloading the free trial version and follow along with the Tutorial they provide. I'm not 100% sure but I think you can carve the provided sample. Available in Aspire, VCarve and DXF format for those who want to make their own. Remembat that the lithophane needs to be 30mmx 40mm to fit properly.